In South Texas we have turned great food into an art form. All across the state friends gather to swap stories and compare recipes, and back in the 70's my Dad set out to show everyone what *REAL* Texas eating was all about. He worked hard in his garage to make the best, the freshest tasting salsa this side of the Mexican border. The first time he presented his concoction everyone went crazy over it and they all took some home. Pretty soon they were serving Daddy's salsa to their friends and they all took some home too! Before long all these folks were coming to Daddy's garage bringing bottles, cans, even empty butter dishes and filling them up with that fantastic salsa. 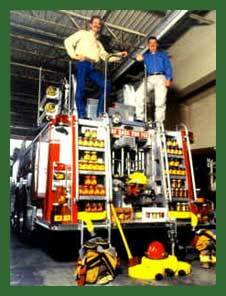 Meanwhile I was busy fighting fires and rescuing kittens from trees like every good fireman. Well, since all this fuss was being made my partner and I decided we'd learn how to make my Dad's great tasting salsa in our time off. Using my Daddy's recipe, step by step, we used the purest natural ingredients we could find. We never added water, starch, or any preservatives since that would just muddy up the taste. We were so proud of what we did we started putting it in real jars and even put a label on it like them big city folks did in San Antonio. No matter where we put it, it sold out fast. Pretty soon the stores were coming to us and asking for more. In 1993 our 100% natural-made salsa started winning awards such as, "One of the finest salsas made in the Southwestern United States" and we still keep on winning awards today! About this point we decided to cook up different fire alarm flavors for different folks. After that we kept fooling around and came up with tasty Bar-B-Que, Jalapeño and Chili sauces. No matter what we came up with we stuck with the best part of the original - all natural ingredients and home made TLC. We're making a point of starting little fires right here in San Antonio, Texas, where we are cookin' up the freshest, finest Salsa, Bar-B-Que and Chili sauce products you can buy. 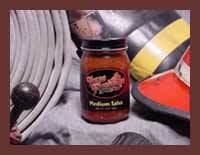 Stock up on Texas Firehouse and become a true "Texas Chief". Order by the case or 3 jar gift box and get ready for some fine Texas eating.